There has been significant media coverage of the autonomous, self driving cars initiative that has been gathering momentum this year. To most of us, the idea of a car that can drive itself is still in the realms of sci-fi however slowly but surely, self-driving technology has been creeping into modern day vehicles. It was recently reported in the Telegraph that more than half of the UK’s new cars are now sold with autonomous safety technology. What Are Self Driving Cars? The autonomous car (AKA auto-car, driverless car, self-driving car or robotic car) is a vehicle that is capable of sensing its environment and navigating itself without any human input. The technology implement within these vehicles includes radar, lidar, GPS, Odometry as well as computer vision which work together to help the vehicle identify a suitable path and detect obstacles. Self-driving have control systems that are capable of analysing sensory data to distinguish between different cars that are on the road, which helps it plan a route to the desired location. Essentially, it is an auto-pilot system! So which companies are currently the big guns when it comes to this auto-car initiative? The internet giant seems to be limitless in its endeavours and it announced the development of auto-cars back in 2009 with testing beginning on California’s roads in 2012. In 2016, it was widely reported how one of its auto-cars had struck a bus for which Google said it bore “some responsibility”. Google has claimed however that its vehicles drove more than one million miles before that without incident and aims to have vehicles available to the public by 2020. One of the more traditional car making giants to establish itself at the forefront of the auto-car market, Ford has made no secret of its aim to invest heavily in autonomous technology. A recent rumour has suggested that Ford may be entering into discussions with Google to form a partnership to develop driverless tech. Tesla has been an icon in the electric car movement and has rapidly added semi-auto tech to its high-end vehicles. Features have included an “auto-pilot” mode which allows the car to navigate itself in certain situations. Tesla also boast a “Summon” command which allows the vehicle to be summoned to a location via the owner’s smartphone! Having already revolutionised the taxi service in recent years, Uber is now aiming to go one step further by having automated taxis; a move which they claim would drastically reduce fares. Apple is said to have hired thousands of engineers but is notoriously quiet on the publicity front and not made any public announcements. Why are auto-cars considered to be the future of motoring? What benefits do they bring? One of the main intentions behind their invention is to eliminate the element of human error which results in road traffic collisions. By relinquishing control of the vehicles we drive to a “superior” artificial intelligence, we will apparently be much safer on the roads however there is a danger that motorists may become too reliant upon technology that is not quite ready to take the wheel indefinitely. If all of these benefits came to fruition, then the future of the auto-car does indeed look bright. That said, is the technology ready to deliver on these promises and will we, the public, feel safer with automated cars on the roads? Will all drivers want to give up control of their vehicle? Will owners of auto cars be experienced enough to take the wheel should anything go wrong? Loss of driving related jobs. The risk of software malfunction. What happens when the system may be using an out of date map? Is the current road infrastructure sufficient? The possibility of self driving cars raises a number of questions in respect of road traffic offences and who will responsible for any incidents that occur. One of the main issues in any motoring prosecution is who was driving the vehicle. Will self-ddriving mean that prosecutions will no longer be brought against the individual but rather the manufacturer of either the vehicle itself or the software operating it? If we use the drink driving motor offence as an example, the elements of the offence are that the motorist is driving a vehicle on a public road or in a public place and whilst they are over the prescribed limit. The same elements exist in cases of drug driving but we will stick with alcohol related allegations for this example. Is the software going to be fool-proof enough to negate any need for human input? What happens if the software fails? What happens if someone crashes into the vehicle and the software is then disabled? Would it allow the driver to take control? Those under the influence of alcohol often suffer from impaired judgement. Would the system prevent passengers in this situation from interfering with the controls? Could it be proven whether they had or not? Could a drunken motorist drive the car but then quickly switch it into auto the moment they see a police vehicle? This list only skims the surface of potential issues with self-driving cars and the law and I have no doubt a more exhaustive list could be produced should the issue be analysed more ardently. If self-driving cars did prevent the passenger from becoming the driver, there is also an interesting issue of whether or not they would still be considered “in charge” of it. It is an offence to be drunk whilst “in charge” of a motor vehicle which is why many unsuspecting motorists who plan to sleep a few drinks off in their car find themselves faced with criminal charges. In some circumstances, it is possible to argue that a motorist has ceased being “in charge” of their vehicle which means they cannot be prosecuted for the offence. An example would be letting someone else drive your car whilst you become a passenger. Is this going to be the case with self-driving cars? Technically, in the absence of another human driver I would say that the passenger still is “in charge” of the self-driving car and as such, they would be committing an offence by being drunk inside of it. If anything does go wrong, then it is the passenger who should be responsible for the vehicle. Another defence to being drunk in charge of a motor vehicle is if there was no likelihood of the motorist driving the vehicle whilst over the limit. Again, I do not think the court would accept that an auto-car ensures no likelihood of you driving whilst over the limit. It is an interesting time to be involved in the world of road traffic law when there are potentially revolutionary changes on the horizon that really do propel us into a realm previously considered to be science fiction. I for one am excited to see how auto-cars develop and how they change the current climate in both the consumer and service markets. Need Help from a Specialist Drug & Drink Driving Lawyer? Neil Sargeant is head of Olliers Motor Law having specialised solely in road traffic cases since 2008 . 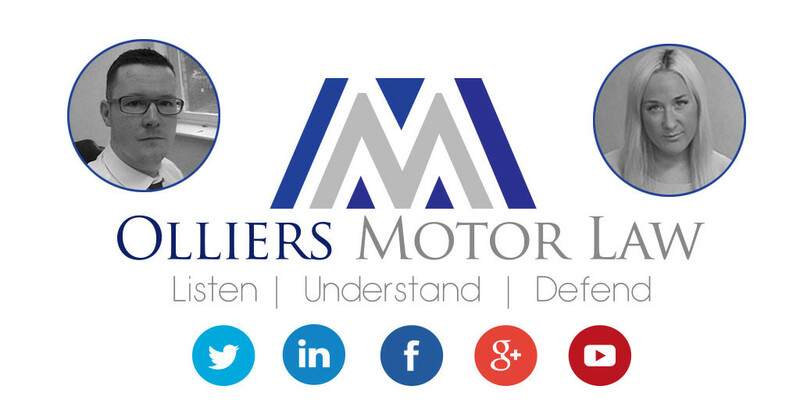 If you are facing prosecution then please give the team at Olliers Motor Law a call on 0808 168 0017 for free advice.